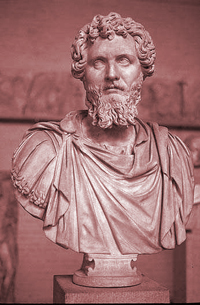 Septimius Severus was one of the first native African Roman emperors, founder of the Severan Dynasty and an aggressive, accomplished general. He was campaigning in Pannonia and Illyria when the emperor Commodus was murdered. His successor, Pertinax, lasted three months before he too was assassinated. The Praetorian guards arranged the succession of Didius Julianus. With the empire in disarray, Severus marched on Rome and was proclaimed emperor. Severus then went to the East to overthrow Pescennius Niger, the governor of Syria, who had also been proclaimed emperor by his legions and defeated him. He took Byzantium in 196 and subdued the rebellious Arabs of Mesopotamia. Returning to the West, he defeated Clodius Albinus, another usurper in Gaul, and returning eastward, attacked and expelled the Parthians from Mesopotamia. In 208 Severus went to Britain. From there he harassed Scotland but he died at York before completing his plans for a large invasion. Severus built a strong army, increasing the number of legions, and eliminating the large commands that had been common for Rome thus protecting himself against being overthrown while he protected Rome. He ruled with vigor and, when he found it useful, a calculated cruelty. He was succeeded by his sons Caracalla and Geta though Geta would be killed soon after.